"Found It!" 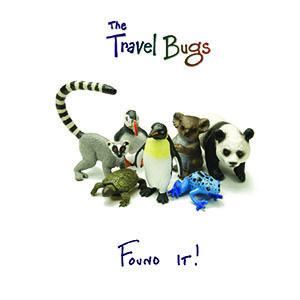 full-length CD by the Travel Bugs. 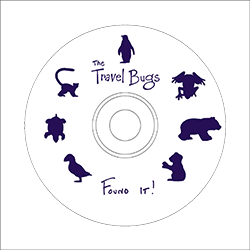 “Found It!” is a collection of songs about Geocaching, and the style of the tunes ranges from pop-rock to bluegrass to blues with just about everything in between… a great trade item or gift for the Geocacher in your family and the perfect soundtrack for caching! 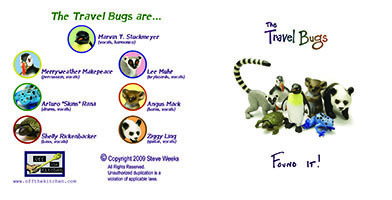 I wrote, recorded and engineered all the songs on the CD as well as designing the cover layout. I employed a photographer to create professional images and used Adobe Photoshop to create the cover art, matching specifications provided by the CD manufacturer. 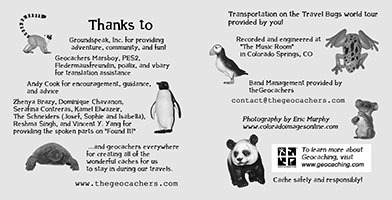 The CD has sold worldwide in over 15 countries and has been showcased on numerous Geocachign radio programs, magazines and Podcasts.